Bond with friends and burn rubber with this racing simulation - so realistic, drivers can almost smell petrol in the air. 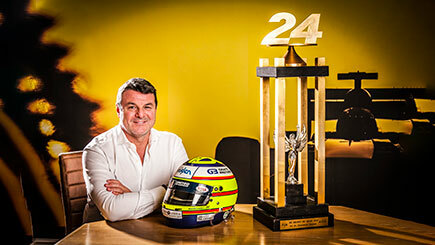 On arrival, mingle over tea and coffee before meeting Formula 1 legend and Le Mans winner Mark Blundell! Next benefit from coaching from a professional instructor, both in groups and on a one-to-one basis, as you push your driving skills to the test. Drivers receive feedback on their performance in preparation for the main event, The Silverstone Challenge. Race around the circuit and see if you can beat Mark's time for the fastest lap. Results are displayed on a Top Gear style leaderboard and those who get the best times get a chance to shine at the end of the day award ceremony. A tasty Thai lunch with Mark is included. Runs on weekdays throughout the year, subject to availability. Minimum height 4'5'', maximum 6'11''. Expect to be at the venue for five hours in total. The experience starts at 9.30am and finishes around 2.30pm, including an hour long break for lunch in a local Thai restaurant. This experience is exclusively for the six of you. Please dress comfortably and wear flat-soled shoes for driving. Please note Mark will not be present at the driver training.